On the first morning of our visit to see the Saguaro National Park we walked over from our hotel to the nearby Waffle House breakfast joint on Ina Rd. These three regulars were roosting in their “spot;” the corner of the counter. It’s prime location to take in the view of the grill and the counter staff for coffee refill requests. Right? 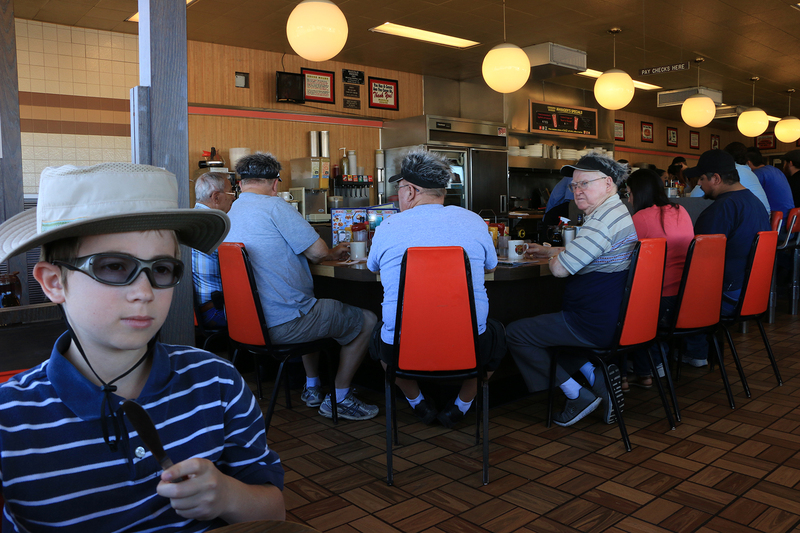 The buddies were all bald old timers wearing matching visor hats that were topped with fake hair. What fun! As I focused on the three of them, my son slid on his bench seat into the left corner of the frame. At the same time, the member of the Waffle Gang turned his face to the side for a grumpy profile. That was my magic moment. SNAP.